India is leaping towards digitization and ICICI is leading this digital revolution in the financial sector. With lot of firsts and innovations in the digital space in their name, they are bringing this advancement to the field of insurance as well. With everything being online, car insurance renewal can also be availed online now. Normally over 20% car insurance policies are renewed post the renewal date. In such cases Vehicle inspection is required and the Customer needs to wait for the surveyor to inspect their car. But now with this system you can renew your expired policy as well without the need of a surveyor. So you ask me how can this be done? Simple, through your Smartphone! 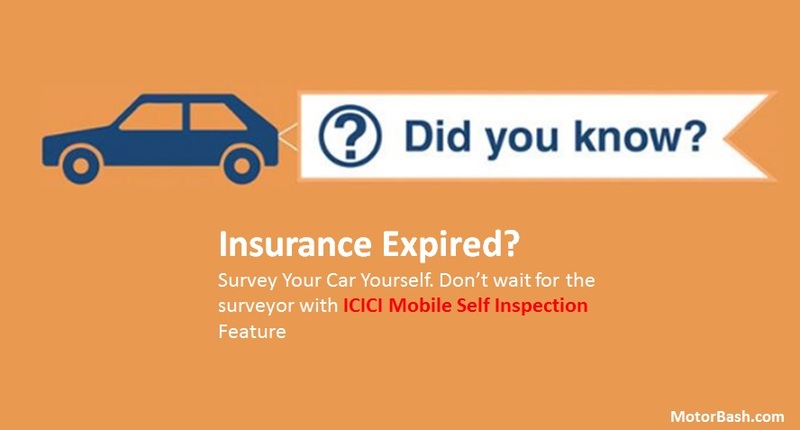 ICICI Mobile Self Inspection: How does it work? 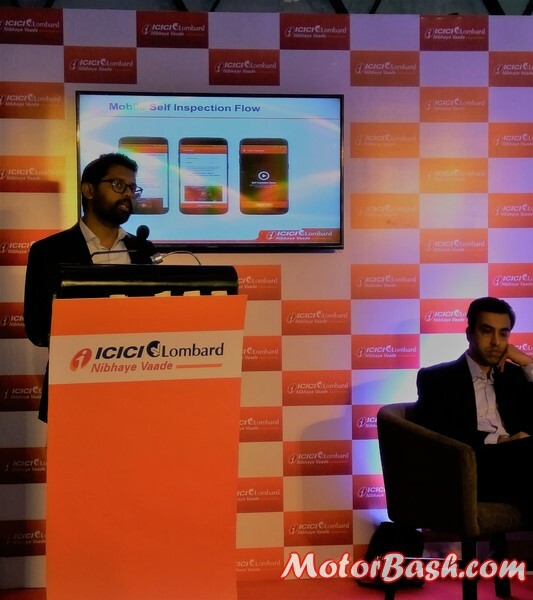 ICICI Lombard has launched a unique feature in its app Insure, ‘Mobile Self Inspection’. It allows customers a hassle free renewal of their lapsed motor insurance policy. (When you have an app for almost everything, why not make your lapsed insurance renewals simple and fast?) So all you have to do is, download this app ICICI Lombard Insure via Google Play (for Android users) or Apple App Store (for iPhone users). Once downloaded follow the step by step process to make a survey video of your vehicle. It includes the chassis number, the full 360 degree video of car and the car under body. The video must be made at one go, it cannot be paused but it can only be stopped. As I questioned on why one full video rather than 3 part video, the answer was that this was made as a deterrent to people who might misuse it. Also the entire process via this system is highly secured as the videos cannot be saved, copied or edited. Once you have completed recording the video it will be uploaded to the system. The Customer Service Representative (CSR) will receive the video and check for any problem with it. If they find any, they will send a push message and also the customer will get a call back stating what was wrong with the video. Once the video is approved by the CSR you get a message that it is approved, you can complete the rest of the formalities quickly and get the insurance immediately. 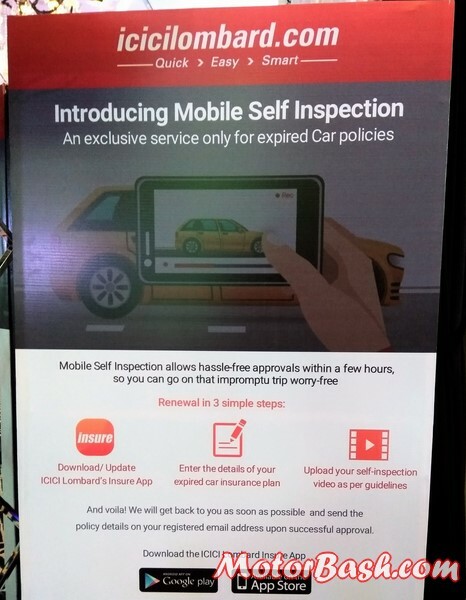 This ‘Mobile Self Inspection’ system is the first of its kind in India. Customer can now avoid the physical presence of an insurance surveyor, which has made this process very convenient and a seamless experience. Currently this feature is only available for four wheelers, hence the people who own a two wheeler will have to wait a little longer to get it. But as I feel with the rapid penetration of Smartphone industry and growing digitization this won’t take too long to arrive as well.